One of the things I dislike is when fantasy is wedded to the epic or the s&s models, and that's not a problem here. 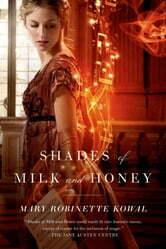 The story should be satisfying to any fan of Jane Austen who also has the sensibility of a fantasy fan. Yes, the magic is explained more overtly than in some stories, but in a way that suits the conceit. Though I had Pride and Prejudice as a mental model, my understanding of it led me to expect the heroine to fall for a different man. The surprise when she didn't was delightful.